A medieval castle built by William the Conqueror in 1068, Warwick Castle is considered to be one of the top historic public attractions in the UK. Purchased in 2007 by Merlin Entertainments, the castle gets around half a million visitors a year and aims to offer them an interactive historic experience like no other. The new Knight’s Village consists of 28 accommodation lodges built within the 64 acre wooded estate and is designed to specifically appeal primarily to young families, with couples and corporate/ evening event groups being the secondary targets. The lodges were built on a site previously used for themed camping accommodation, upon a Grade 1 listed landscape. The brief was to create two themed lodge designs that could be used year-round – one that sleeps up to 5 guests and one that sleeps up to 7. All lodges have a wet room with a shower and are fitted with a temperature control system, in addition to cable TV and free WiFi. The lodges have been designed to offer a completely immersive experience, relevant to the history of the site. The lodge interiors offer historical escapism, with details such as shields on the walls, wrought-iron chandeliers and carved wooden headboards. The style complements the wider sense of the castle, where entertainment includes jousting shows, birds of prey, medieval feasts and archery displays. By offering more diversity and capacity within the short-stay holiday market, the unique lodges will not only increase the appeal of Warwick Castle as a tourist destination but will also have a positive effect on the local area. Directly creating 50 new jobs, it’s predicted that the lodges will economically benefit the district by an estimated £2.1 million a year through guests visiting surrounding towns. 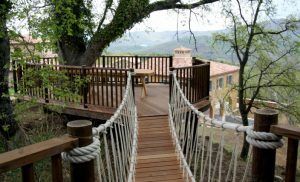 The treetop decks tree house project incorporates several different tree decks within the grounds of the clients private estate in Tuscany, Italy. An extraordinary treehouse nestled within the branches of a magnificent Oak tree, especially designed for the whole family to enjoy. Pupils at The Collette School can now enjoy a truly unique and magical learning space with the addition of a treehouse classroom and library to their school.